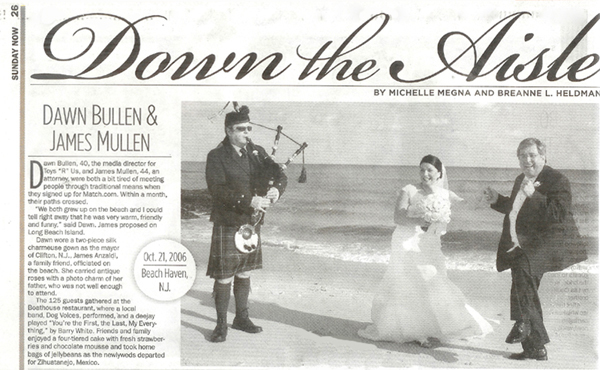 Most frequently, the wedding party requests a piper to play outside the church before and after the wedding ceremony. Sometimes they also request tunes to be played during the ceremony inside the church, for example, during the processional, recessional, or candle lighting. On some occasions, piping is done at a wedding where the ceremony and reception are held in the same building. 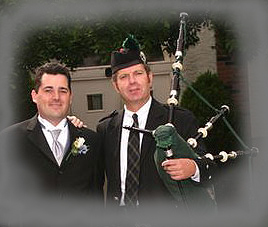 At one such wedding, the pipes were played on the balcony as guests arrived, played for the processional and recessional, and then played again for a short time as guests filed out to the cocktail hour. 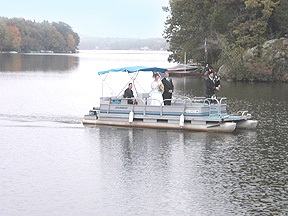 During outdoor weddings, the piping is usually incorporated into the ceremony. Another option is to have the pipes played at a cocktail hour or at a certain point during the reception. The cocktail hour option is especially popular where there is an outdoor garden or patio for the cocktail hour. If you are interested in choosing particular tunes, you can hear midi files of simulated bagpipes at under Repertoire. Click Sound Samples to hear Michael play tunes on an electronic bagpipe. Michael plays the Great Highland Bagpipes. The Scottish Highland Bagpipe and the Irish Great Pipe are essentially the same. The Irish pipe traditionally has only two drones (bass and tenor), but so did the Scottish pipe at one time, if you go back into the early 18th century. There are other types of pipe known as small pipes in both countries. The most well known Irish pipe is not the Great Pipe (also known as War Pipe) but the uilleann pipe, which means elbow pipe, so called because it is played by pumping a bellows rather than by blowing. This type of pipe is used by the Chieftains and other bands along with guitars, fiddles, harp, etc. If you are looking for a piper to play outside the church, you would want a Great Pipe. If you like a tune played during the ceremony, you could also use the Great Pipe, but the uilleann pipe would be good indoors. Then again, Highland pipes are often played at cocktail hours for warm weather receptions when they are outdoors. For a detailed history of the Irish War Pipe, click here. To hire a piper or pipers for your wedding or other event, contact us via castledangerous@gmail.com or phone 609.404.1596. © 2001-2003 Castle Dangerous. All rights reserved. Not for dissemination or other use without the expressed, written permission of the author.